Thanks for all the comments on my spring-colored blocks and stripes quilt! I hope you’ll like this version too! This is actually the first version I made of this pattern. I made it about a month ago, at the beginning of January, and if you know me at all, that’s a long time for me to wait to blog something! I had wanted to get the tutorial written first, and unfortunately tutorials tend to take me a while… so hence the delay! Anyway, what started me thinking about this quilt was actually this great piece of Etsuko Furuya double gauze fabric that Morgan gave to me for Christmas. I briefly considered a whole cloth quilt, maybe buying another double gauze print for the other side, but then came up with this idea instead. As with the previous quilt, I started with the backing and then designed the front around the colors in the backing fabric. The colors in this print are interesting, and generally not anything I’d put together, so it was kind of fun mixing and matching these prints to come up with a selection that ‘went’ with the backing. 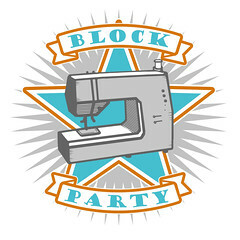 Once again, I used several different prints for the blocks and paired them with other scrap solids for the stripes. I meandered this one, and after a quick wash and dry, it’s super soft and crinkly. 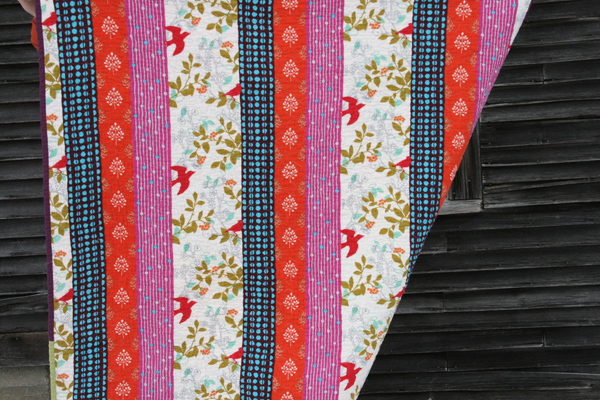 I really can’t say enough about the double gauze as a backing – in addition to being super soft, it also gives the quilt a really nice drape. It measures about 39″ x 40″ and is now for sale in the shop. 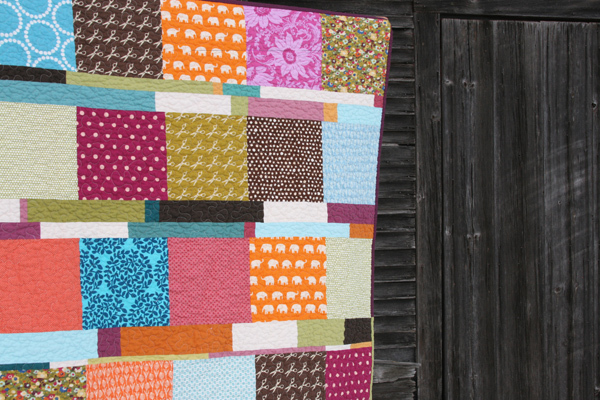 If you want to make a similar quilt, you can find the tutorial here. Echino double gauze fabric purchased from Hawthorne Threads (and it even comes in a couple other colors too!). This entry was posted in [search] Other Quilts, 2010 Finished Quilts, Finished Quilts, Posts about Quilts, Quilts and tagged baby quilt, double gauze, Echino, Etsuko Furuya, handmade, quilt, quilting. Bookmark the permalink. 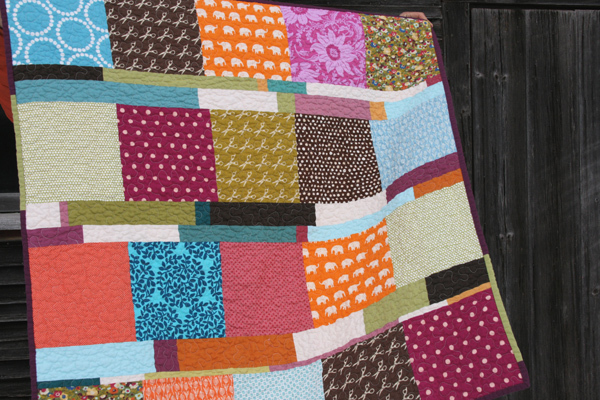 I love the quilt, such pretty colours. I love that your backs look as good as your fronts! I love it! By the way, who makes the elephant print? I love it and I’ve seen it in a bunch of quilts but I haven’t seen it for sale and I’d love to buy some. Thanks! Really, really beautiful and bright. Question: what colour thread do you use to meander quilt something with such different colours and values? Felicity – I used a cream colored thread to quilt this one. Cream blends surprisingly well! You are addicted – and I can’t blame ya’. They look like a lot of fun. 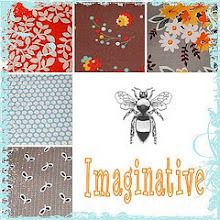 I have that Echino fabric too – it’s hard trying to figure out what to do with it – love your idea…and great tutorial! Thanks – I’ll give it a whirl. So cute!! Once again I love the colors that you put together..for some reason they always seem to work together in an unexpected way. The colors are so bright and cheery. Thank you so much for your inspiration. recouping from a stroke on vacation in Aruba. itching to sew. I made a promise if i survived Charity quilts for kids in need and other causes besides gifts for babies and adults. Woo hoo. You have beautiful fabrics. Where do you live? Pleas keep me on your em ail… barb. This is a perfect way to end up with some beauties.